^ 1.0 1.1 1.2 Official biography. [2007-03-31]. ^ Sherrard, Brooke. Review of: David John Marley, Pat Robertson: An American Life. The Journal of Southern Religion. 2007 [2014-11-17]. ^ ^ "California Governor Arnold Schwarzenegger Keeps Promise and Will Veto Abominable Homosexual 'Marriage' Bill Passed By Legislature Which Ignored Overwhelming Vote of California Voters in Proposition 22 Banning Homosexual 'Marriage'". Christian Coalition. 2005-09-09. 存档副本. [2007-03-31]. （原始内容存档于2007-02-03）. . Retrieved 2007-03-31. ^ "Abortion to Die by 1,000 Cuts After Today's Supreme Court Ruling". Christian Coalition. 2007-01-18. 存档副本. [2014-08-12]. （原始内容存档于2007-10-12）. . Retrieved 2007-03-31. ^ Falwell apologizes to gays, feminists, lesbians. CNN. 2009-10-14 [2010-09-07]. （原始内容存档于2013-04-01）. ^ Hamby, Peter. McDonnell won’t disavow Robertson’s Islam remarks. CNN. 2009-11-18 [2010-09-07]. Boston, Robert. 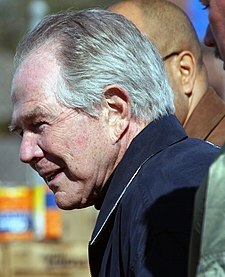 The Most Dangerous Man in America: Pat Robertson and the Rise of the Christian Coalition. Amherst, NY: Prometheus Books. 1996. ISBN 978-1-57392-053-7. Harrell, Jr., David Edwin. Pat Robertson: A Life and Legacy. Grand Rapids, Mich.: William B. Eerdmans Pub. 2010. ISBN 978-0-8028-6384-3.